I saw these on another blog, Ezra Pound Cake, and thought they were the perfect thing to make today. Why today? Because it is time change, and to me that signals the countdown to spring. It is never fun to lose an hours sleep but tonight we will all be smiling when it is still light out this evening. 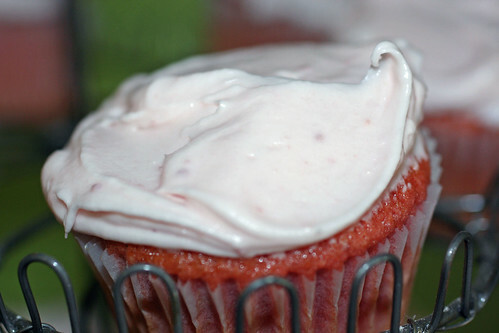 These cupcakes are so moist and the strawberry flavor subtly comes through. These cupcakes, well they just make you smile. Preheat oven to 350 degrees F. Line 2 (12-cup) muffins pans with cupcake liners. In a large bowl, combine cake mix and gelatin. 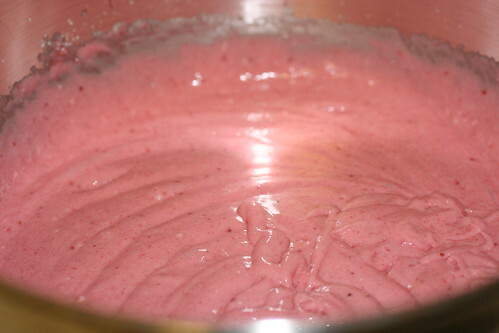 Add pureed strawberries, eggs, oil, and water; beat at medium speed with an electric mixer until smooth. 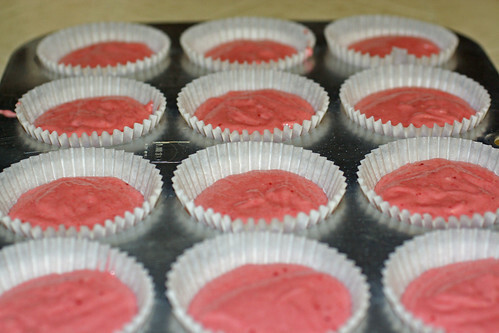 Divide the batter evenly among the cupcake tins about 2/3 filled. Bake for about 20 minutes, turning the pans once, halfway through. Test the cupcakes with a toothpick for doneness. Remove from oven and cool completely before frosting. For the frosting: In a large bowl, beat butter and cream cheese at medium speed with an electric mixer until creamy. Beat in 1/4 cup of the strawberry puree and the vanilla extract. (The rest of the puree is leftover but can be used in smoothies or on ice cream for a delicious treat.) Gradually add confectioners’ sugar, beating until smooth. 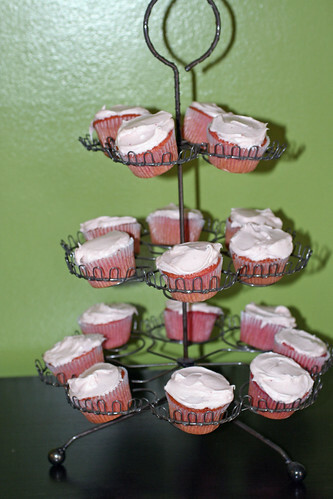 Frost the cupcakes with a butter knife or spatula, or pipe on the frosting with a big star tip. Garnish with fresh strawberries, if desired.